As experienced general contractors, we like to be as informative about the home building process as possible. If your question is not answered here, please don't hesitate to contact us. Why build with Timber Ridge Homes? Besides our superior attention to detail, we keep you very informed about the home building process. You will know exactly what will be happening next and if the project is on schedule. We pride ourselves in establishing exceptional communication with every homeowner. It makes the process fun! (At least that's what many homeowners have told us.) Building a new home seems like it should be a very stressful undertaking; this doesn't have to be the case. At Timber Ridge Homes, we take great pleasure in walking you through every aspect of your home building project. We encourage you to stop by anytime to experience the progress first hand and get excited about your new home! Where will Timber Ridge Homes build? We build homes throughout Western Wisconsin. We also have residential lots available for purchase in Menomonie. If you are having trouble finding the right land to meet your needs, contact us and we would be glad to assist you. How much does a Timber Ridge Home cost? We do not restrict our home building projects to any certain price range. Each home is designed to meet your specifications and your budget. With a very specific contract, an accurate budget is determined and followed throughout the entire home building process. Do I need my own floor plan? A Timber Ridge Home can come from a finished floor plan, a plan you found on the internet, a sketch on a napkin, or a folder of pictures and ideas. Whatever information you have compiled is enough to get started. Our homebuilders will work with you to expand your ideas into a working floor plan. How do I make my home energy efficient? Timber Ridge Homes uses the Wisconsin Energy Star program. This program certifies that your home meets sustainable building and energy standards. Upon completion of your home building process, this programs conducts tests to ensure your new home is performing at peak energy efficiency. Using new technology such as geothermal heating/cooling and air source heat pumps, you can substantially reduce your utility bills. 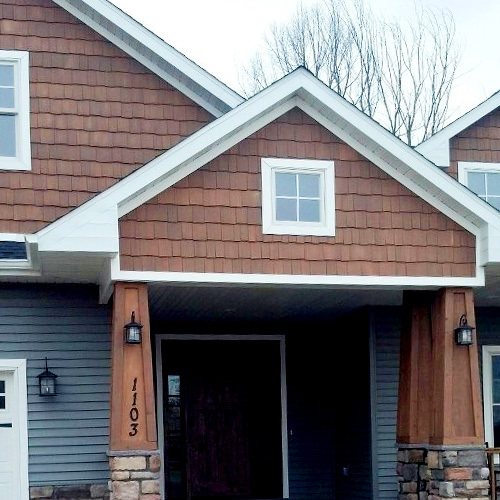 "Timber Ridge Homes completed our home right on schedule and under budget! We cannot say enough good things about working with Timber Ridge. Their professionalism is beyond reproach. This was evident to us when we heard from a third-party they turned away business when a customer asked them to build a house identical to ours in the same area — a response for which we are extremely grateful." We have built hundreds new homes throughout Menomonie and Western Wisconsin. We never cut corners. Each home is built with superior craftsmanship, using only quality materials.